A patchy lawn is usually caused by disease or poor cultivation techniques. Mowing grass to the correct height for the grass variety, proper fertilization and dethatching of a lawn will prevent the appearance of dead spots in the lawn. If the lawn is already patchy and proper cultivation techniques have failed to promote new growth, overseeding the lawn in the winter may be necessary to fill in the dead spots. Mow the lawn with a grass-catcher bag attached to the mower to remove excess clippings from the lawn, according to the University of New Hampshire Extension. Different grass varieties require specific mowing height, but most require a length between 2 1/2 to 3 inches. 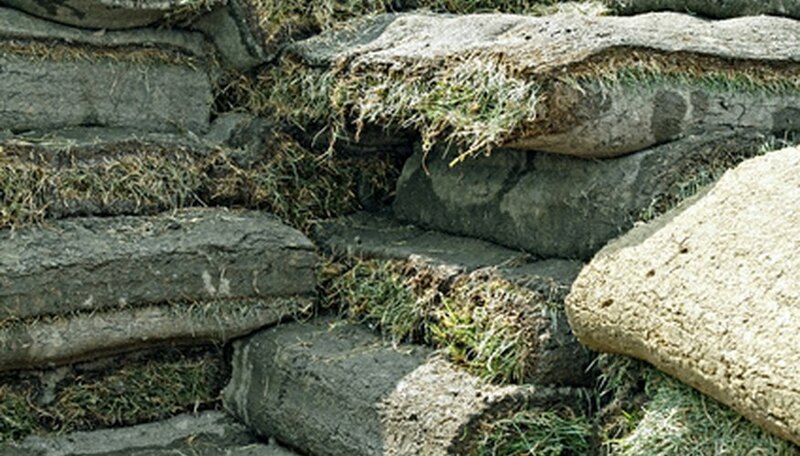 Run a core aeration device, either machine or hand powered, in two directions to relieve compaction and remove thatch, according to the Kansas State University Extension. Core aeration reduces soil compaction, improves soil seepage and prepares small holes for the grass seed, according to the University of Illinois. Calculate how many square feet your yard consists of using a tape measure. Spread seed throughout the lawn using fescue grass or Kentucky bluegrass. Apply fescue at 6 to 8 pounds per 1,000 square feet and Kentucky bluegrass at 2 to 3 pounds per 1,000 square feet using a seed spreader, according to Kansas State University. Run the seeder from north to south through the lawn, overlapping seed with the tire track made from the previous pass. Rake the plugs of dirt created by the aerator in the lawn to break them apart and cover the grass seed. Water the seed lightly and continue to do so daily for two to three weeks until the seed germinates. Kansas State University recommends watering up to three times a day on hot days with little rain. Apply a complete fertilizer, such as 16-4-8 or 10-10-10, to the seeded lawn once the new grass is mowed twice, according to the Clemson University Extension.